When you are cold emailing people (i.e. you are the one sending the first email), we highly recommend that you warm up your email address before using it at full capacity. At Anyleads, we often see that totally new email addresses used for outbound without any warm-up get blocked soon after an outbound campaign is fired off. 1. Warming up your List. Don’t send more than 25 emails per day per email address. Increment this limit per 25 every week. 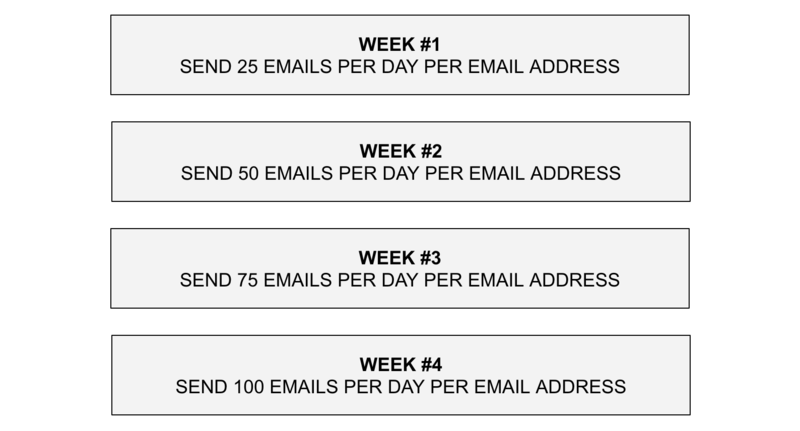 So, if you have 3 email accounts, you will be able to send 75 emails per day on the first week. Then, 7 days later, 150 emails etc. SpamAssassin (the #1 anti-spam platform used by by many hosts), marks as suspicious all messages coming from addresses on freshly set up domains (younger than 14 days). 2. Configure a limit for your sender. How can you configure a sending limit for each sender. Look at this article about how you can do it: how to set a daily limitation to a sender?. You cannot send more than 500 emails per day with a regular gmail account. You cannot send more than 2,000 emails per day with a google suite gmail account. 3. Don&apos;t use your primary domain. Also, for the safety of your company domain, your sales should not send cold emails from it. If your company is anyleads.com, buy and send from anyleads-marketing.com (choose the name you want, it does not have to be prefixed by -marketing). But, how do you know if your emails are being received in the spam folder? Well... the open rate of your campaign is here to tell you this. If it is under 5%, your email list is either very bad or you ended up as spam. And don&apos;t forget to reply back, it is a great way to increase the reputation of your email address. 4. Set up your SPF and DKIM records. Another thing is to set up your SPF and DKIM records. This is really important to increase your email deliverability. Sender Policy Framework (SPF) is a security mechanism created to prevent the bad guys from sending emails in your behalf. So make sure to do it properly! To go further, you can read this article.